Kelsey Ricks has joined Oklahoma’s Project Transformation staff as program director. She brings great relevant experience to this United Methodist-supported ministry. PT operates literacy day camps for elementary kids in summer at several sites across the state. Before accepting the position, Ricks had spent two months in Belmopan, Belize, working with A Better Belize. "I helped them to develop their children’s programs in the village by leading an academic- and faith-based day camp at the local school," she said. An Oklahoma City University graduate, she also served in Belize in early 2016, as part of an OCU student mission team. homeless children in Oklahoma City, through AmeriCorps. She also has an earlier, direct connection to Project Transformation. She was house chaplain for PT in Oklahoma City in Summer 2014. "Project Transformation is all about building relationships: with children, with parents, with churches, and with college students," she said. "Through my spiritual journey in The United Methodist Church, I have learned that the most effective way to share the love of God and make lasting, impactful change is to build strong relationships and foster deep connections with our communities." and master’s in liberal arts with emphasis on nonprofit leadership, both from OCU. A lifelong United Methodist, she said both her parents serve in the Texas Conference. College students interested in PT internships may contact Ricks at 405-530-2010 or kricks@okumc.org. 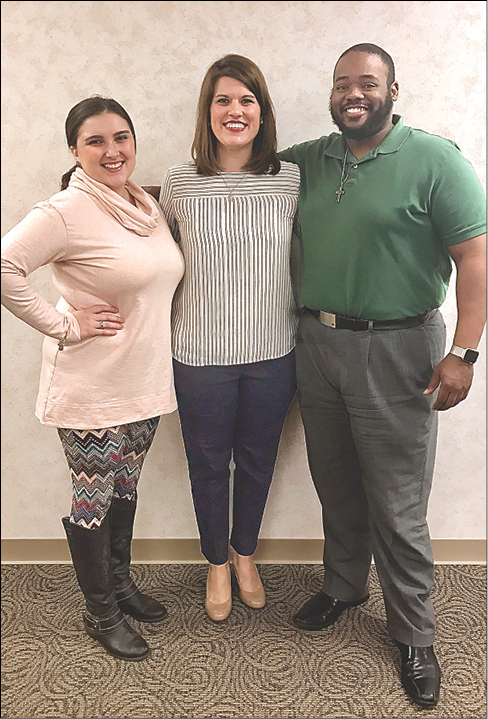 From left, Oklahoma’s Project Transformation leaders are Sarah Nichols, executive director; Kelsey Ricks, program director; and Charlie Ludden, associate director.